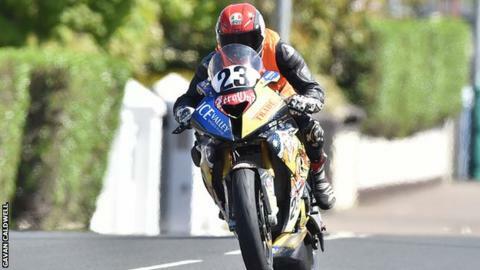 French rider Franck Petricola remains in a critical condition in hospital after a crash at the North West 200 practice on Tuesday. The 31-year-old, competing in the event for the first time, crashed close to the start/finish area just four minutes before the session was due to end. Petricola is in intensive care at Belfast's Royal Victoria Hospital after being airlifted from the circuit. The motorcyclist received lengthy treatment at the scene. Petricola's crash at Primrose Corner happened in the closing minutes of the Superstock session on the opening day of official practice at the Northern Ireland motorcycling meeting. No other bikes were involved. North West 200 race director Mervyn White said safety bales at the side of the track saved his life. "He came off at high speed at Primrose Corner, which is a high speed corner, 100mph-plus type of thing," he said. "He went into the bales at the side of the track, the safety bales, which are there to prevent major injuries. "I would say it probably saved his life at the end of the day."